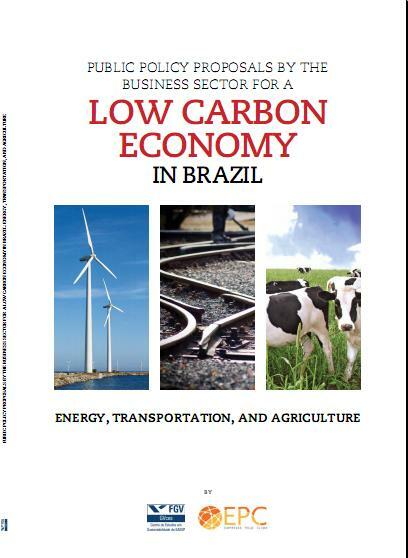 The studies presented here aim to contribute to the debate on the challenges for the creation of a low-carbon economy in Brazil in three relevant sectors: Energy, Transportation, and Agriculture. They focus on the analyses and proposals of economic instruments, which are fundamental for creating the necessary conditions for a competitive Brazilian economy in the context of GHG emissions management. The studies were produced and published by the Businesses for Climate Platform (EPC in Portuguese), created by the fundação Getulio Vargas (fGV) in 2009 as a permanent Brazilian business forum to stimulate dialogue, capacity building, and the construction of partnerships for the transition towards a low carbon intensity economy. This effort has the objective of strengthening the competitiveness of the Brazilian economy, guaranteeing access to increasingly social and environmentally conscious international markets, allowing for the creation of a domestic market propitious to technical development, to innovation and to the adoption of business practices with a lesser potential of emissions of greenhouse gases (GHG), and of promoting Brazilian energy security by fostering the new renewable energies.